Normally, your kidneys screen impurities from your bloodstream. The result of this process is the removal of waste materials and excess fluid in the urine. Occasionally, infections, injuries and disease hamper the ability of the kidneys to perform this process, resulting in renal insufficiency. To confirm a suspicion of renal insufficiency requires evaluating test results together with signs and symptoms to make a final diagnosis. Two important tests are the blood urea nitrogen, or BUN, and the serum creatinine. Creatinine, a waste material, comes from the breakdown of protein in your body. The kidneys filter out the creatinine and eliminate it in the urine. The portion of the kidneys that filters out the creatinine, called the glomerulus, is susceptible to blood vessel problems and infections that cause more creatinine to build up in the bloodstream. The serum creatinine blood test measures the amount of creatinine in the bloodstream when the kidneys are unable to remove it. An elevated serum creatinine reliably reflects renal insufficiency but is taken into consideration with the urine creatinine clearance and blood urea nitrogen. Urea nitrogen comes from protein intake and the breakdown of protein in tissues. Levels of urea nitrogen in the blood fluctuate with a number of conditions such as increased protein intake, intestinal bleeding, infection, fever, dehydration, medications and burns. 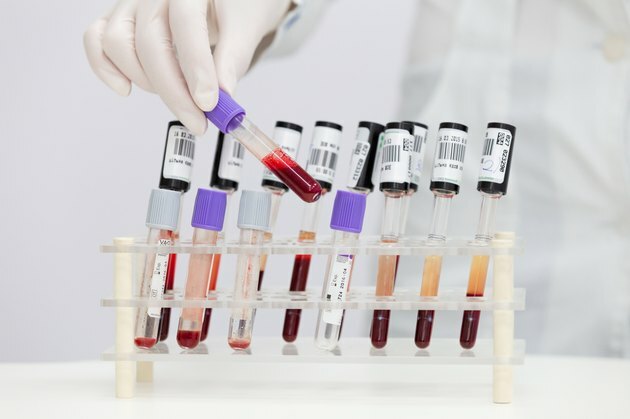 The blood urea nitrogen test doesn't indicate renal insufficiency as well as the serum creatinine, since changing factors contributing to fluctuating values unrelated to kidney function may be present. The BUN should be considered along with the serum creatinine test. Some individuals who develop renal insufficiency exhibit few or mild symptoms or the deficit in kidney function is noted during a yearly physical with no obvious symptoms. In the extreme, an individual might present with extremely high blood pressure, rapidly decreasing kidney function or frank kidney failure. The insufficiency can result from decreasing arterial blood flow to the kidneys as a consequence of renal artery disease. Renal artery stenosis, a narrowing of the arteries caused by plaque formation, leads to renal artery disease. With the reduction of blood delivered to the kidneys for screening and purifying, excess body fluids and wastes build up, blood pressure rises and renal insufficiency follows. The risk factors for developing renal insufficiency include the aging process, gender, race, high cholesterol and triglycerides, smoking and diabetes mellitus. Additional contributing factors include a family history of renal disease, high blood pressure and obesity. Individuals at even higher risk include those with a diagnosis of coronary artery disease, peripheral vascular disease or atherosclerosis. Is a Urine Protein Level of 234.0 High?